To the surprise of very few, Tiger Woods is favored to win this year’s PGA Championship, which starts today and runs through the weekend. The PGA Championship is the fourth and final major of the year. 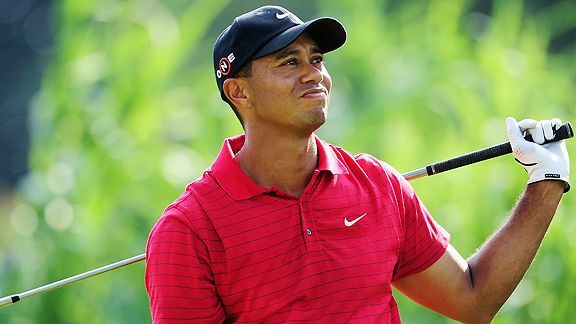 Tiger missed last year’s PGA Championship, but did win the event in 2006 and 2007. He also has some momentum heading into Hazeltine National, winning the two last consecutive tournaments (Bridgestone and the Buick Open) that he has played in, which give him a total of five wins on the year. Tiger’s main competition this weekend, at least based on the odds, appears to be Padraig Harrington (20/1), Phil Mickelson (22/1), Lee Westwood (28/1) and Hunter Mahan (30/1). To check the 2009 PGA Championship leaderboard, click here. Tiger is incredible. Has only palyed this well in 2 majors previous, won um both. Id like to see him ghet a big lead on the 2nd day.